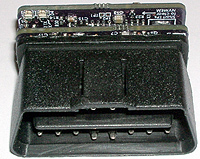 This page contains all the information for all the STN1170 Bluetooth OBD-II module I’ve designed. This is even smaller than my STN1110 based reader (files, comments, and other info still available here: STN1110 OBDII Reader) and is the smallest module of its kind that I’ve seen to date. All of my Bluetooth OBD-II modules work very well with Scantool.net‘s ScanXL OBD-II diagnostic software for Windows. FORScan (for Ford vehciles) and CANIon are other apps that are popular with the STN1170/STN1110 based readers fro Windows. For Android users, my Bluetooth OBD-II adapters are an excellent companion for the Torque app ($5 on the Android Market), which is easily the best OBD-II software available for any Android smart phone or tablet. Palm Pilot and PocketPC users can use OBDGauge, although both of these configurations are untested with my adapters. Essentially as long as you can pair your Palm Pilot or PocketPC device to my adapter via Bluetooth, OBDGauge should be able to communicate with my adapter. IPhone/IPod/IPad owners will not be able to use my Bluetooth adapters with their Apple products due to the lack of an Apple authentication chip in my BT module (the BT module also doesn’t support Apple’s authentication protocol). If you have an Apple device, you will have to purchase a wifi ad-hoc OBD-II adapter if you want a wireless link to your vehicle. Apple also makes it prohibitively expensive and complicated for hobby type people wanting to connect something via Bluetooth to their iOS device. I’m not sure if this is also the case with OSX. 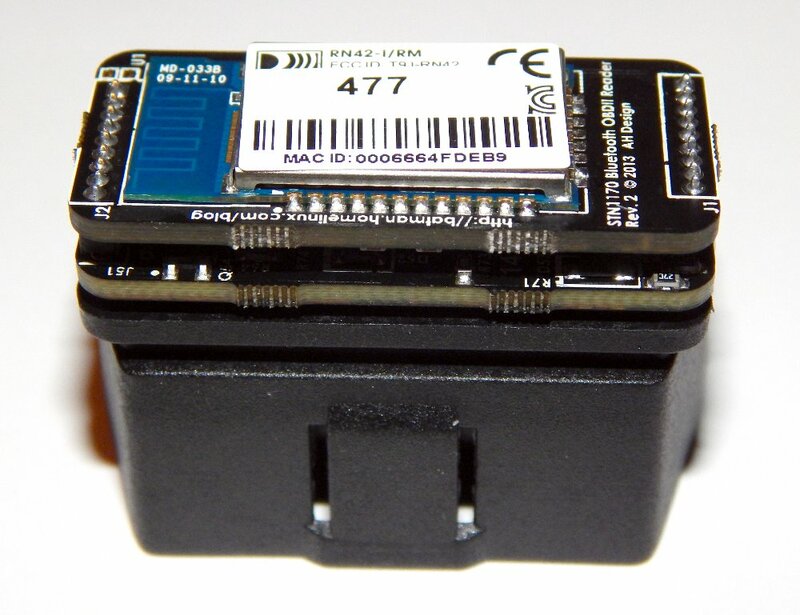 If Bluetooth 4 Low-Energy based OBDII adapters catch on and iOS OBDII software is available, I’ll most likely design a reader for Bluetooth Low Energy. At this point, it doesn’t make sense to create one without software support. Please note that for shipping destinations outside of the USA I am not responsible for any extra customs/duty fees that may be encountered when importing happens, and I am not responsible for lost packages outside of the USA. A tracking number will be provided. If you don’t receive your package within say 4 weeks of me informing you that I shipped your item, contact your customs office as it is probably held up. The amount of tracking provided unfortunately depends on the country being shipped to. For most countries, you’ll receive your package in 2-3 weeks. At the moment, enclosures are not available for the reader. Depending on interest in the readers, their sale may end up funding a custom enclosure design. The STN1170 Bluetooth OBD-II adapter is copyrighted under the Creative Commons Attribution 3.0 license. If you use these sources for creating your own module that you post online, please attribute my module as the original source (as the license states). 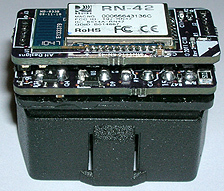 STN1170 OBDII Bluetooth Module by Andrew Honecker is licensed under a Creative Commons Attribution 3.0 Unported License. I noticed that in January you communicated that you have no more completed STN1170 units available. Could you send me a list of what parts you have that you would be willing ton part with? I would really appreciate it. Sorry for the late reply. Really all I have left are OBDII connectors and some bare boards. Everything else has been repurposed or used up for other projects. I came across your site while doing some research on CAN networks. I have been playing around with microcontrollers and trying to learn how things work. I see that you no longer sell these, but I am interested in the parts so I can learn about the STM1170 chip. I would even be interested in building the STM1110 adapter if you don’t have the parts available. I do repair hardware on iProducts, especially from water damage so I am not new to soldering components or complexity. Could you please send me an e-mail, pointing me in the right direction on how to get started? It has been awhile since anything has been mentioned on this site so I hope you still do have some parts lying around or know of somewhere I can buy them. Thanks! Any chance you’d be making another batch of your STN1170 adapters (or even an STN2120 based one) some time in the future ? If you are, I’d be interested in buying one (or two). Would you be ok to ship it to Canada ? Unfortunately no, there just isn’t enough interest in the units to justify the cost to produce, test, and then sit on inventory till they’re sold. Sorry! Sorry I haven’t been getting back to the blog much at all, life has gotten in the way =). I’m don’t think my adapter is really better than the MX per se. The MX is faster for one thing. I don’t recall if it handles MSCAN or not. Mine does, but it seems like everyone is going after the super cheap adapters. It seems like the minority want to buy something that isn’t junk. I have posted on some forums, but a lot of them discourage (or ban) self-promotion, especially if those are your first and only posts. I may consider doing a refresh and seeing if people are interested later this year. It’d be another small batch most likely. Would you have any blank PCBs or defective units that you might want to sell? I do have some leftover populated PCBs that could be sold. They are untested though.